I recently review Julien Schaal’s new Riesling Rosacker Grand Cru 2017 – a very impressive wine in its own right. There is no doubting the pedigree of the Rosacker vineyard which is home to one of Alsace’s greatest wines, Trimbach’s Clos st Hune. But when you want extra muscle power and frame, mineral austerity, age-ability and intensity in your Riesling, you can do no better than the Rangen de Thann Grand Cru vineyard. Often regarded as the grandest of all the Grands Crus, this is the only Cru vineyard located on volcanic rocks. This volcanic soil, combined with a 60 degree slope results in tiny yields of hard-won fruit – but the results are worth the struggle and the concentration and depth of the Riesling wines produced can be extraordinary. This exceptional 2017 is a vintage not to miss! Julien Schaal Riesling Rangen de Thann Grand Cru Volcanique 2017, Alsace, 13 Abv. It may be auto-suggestion but when you first nose the Rangen Volcanique 2017 Riesling you can’t help but notice the incredible dusty, flinty basalt minerality that pervades the wine. Like it’s attractive sibling, the Rosacker, this wine is taut, restrained and initially very tightly wound with shy dusty stony aromatics and subtle hints of lime peel, grated Granny Smith apples and fresh fennel. The palate too is powerful, intense, compact and flinty but also shows off the grand pedigree of Rangen with incredible piercing lime cordial concentration, lemon bon bons and tart crunchy pineapple zest interspersed with pithy, phenolic tannin grip and a flinty, stony, saline, wet river pebble finish. Another fantastic vintage expression for Julien, this wine is built to impress and delivers on so many levels. Drink on release or cellar for 10 to 15+ years. Not only does Julien & Sophie Schaal produce some fantastic Chardonnays from South Africa, but for the past few years, Julien has been making an array of Grand Cru Alsace dry Rieslings under his own name separate to his partnership with Olivier Biechler and the Biechler & Schaal wines. When it comes to Alsace vineyard pedigree, they don’t come more illustrious than the Rosacker Grand Cru vineyard in the village of Hunawihr that is also the source of Domaine Trimbach’s Clos Ste Hune Riesling, probably Alsace’s most famous white wine. The official Rosacker Grand Cru classification covers over 26 hectares on predominantly limestone soils at between 260 and 330 metres above sea level, facing east and south east. Permitted varieties include Pinot Gris, Gewurztraminer and of course Riesling, which forms 65% of the Rosacker Cru. Julien Schaal Rosacker Grand Cru Calcaire 2017, Alsace, 12.5 Abv. Vibrant and youthful, this delicious dry Riesling made from 41 year old vines bristles with dusty limestone mineral lift, lemon rind, spicy citrus, crushed gravel, fresh fennel and dried baking herbs. Initially quite restrained and tight, the nose slowly starts to reveal notes of waxy green apples and wet slate petrichor notes with time in the glass. The medium bodied palate shows fine intensity and a wonderful harmonious balance between sweet lemon pastille fruits, dried herbs, boiled apple bon bons and bright linear acids. A mouth watering example that has ample glycerol palate weight and a lovely dry mineral finish. Drink this beauty now and over the next 5-8+ years. Alsace is a strange wine category in the UK. Generic promotional marketing activity has mainly been focused around the food and wine connection, thus primarily targeting the on-trade or restaurant sector. But like with German wines, dry or sweet, the regional message never seems to be communicated in a clear and digestible consumer format. 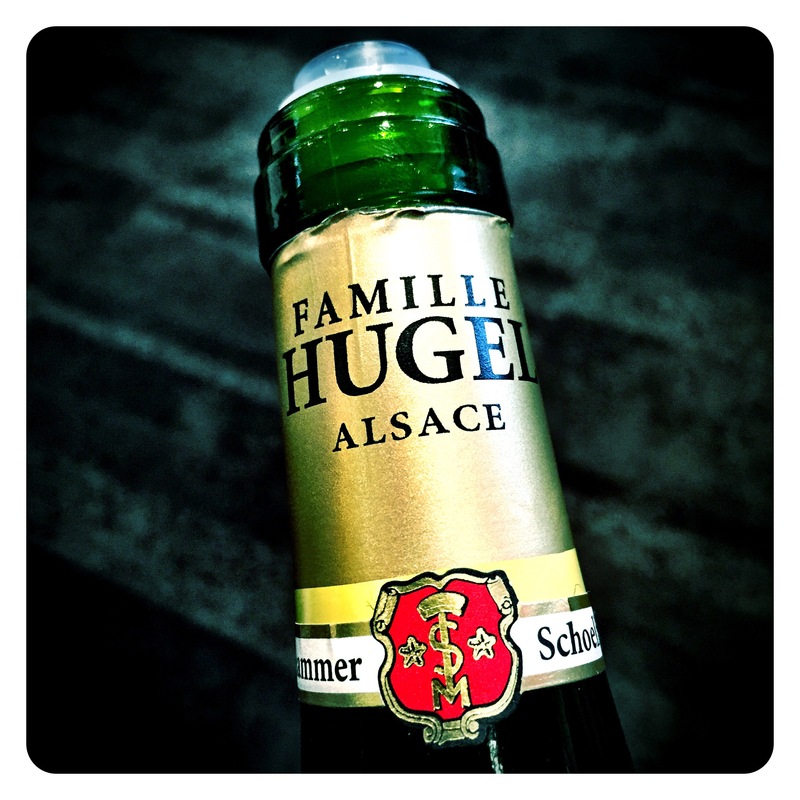 I love Alsace wines. Along with the Loire and Jura, it’s probably still the cheapest, most value for money, under appreciated, premium region in France. For goodness sake, there are 51 Grand Cru appellations to choose from after all! So today I revelled in the opportunity to hook up with Charlotte Hugel to taste their new releases. 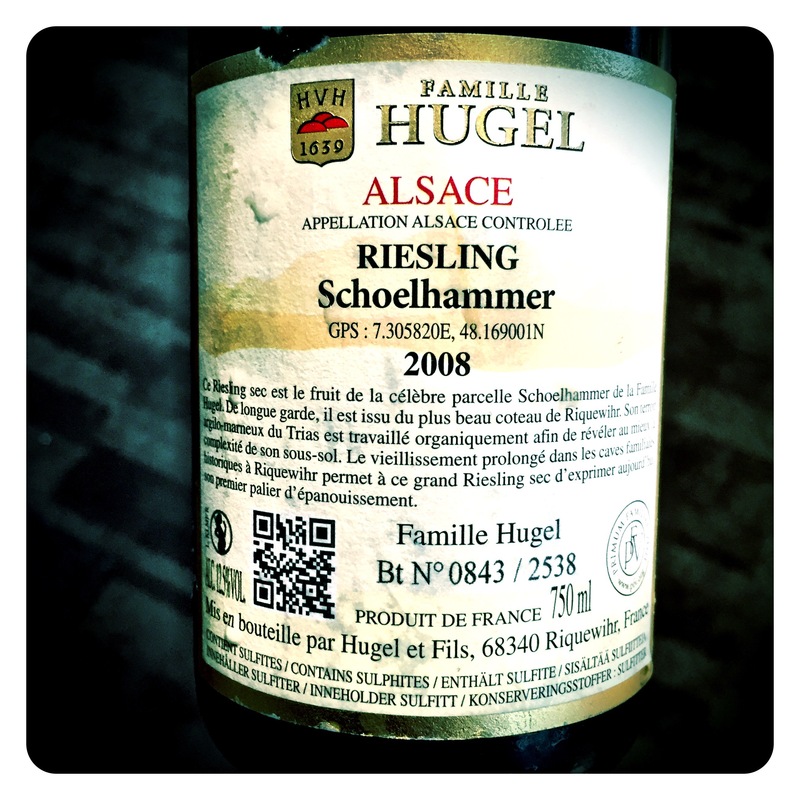 Some how I missed the first vintage of the incredible Schoelhammer Riesling 2007. Luckily today I got to drink the superb 2008 follow up vintage. 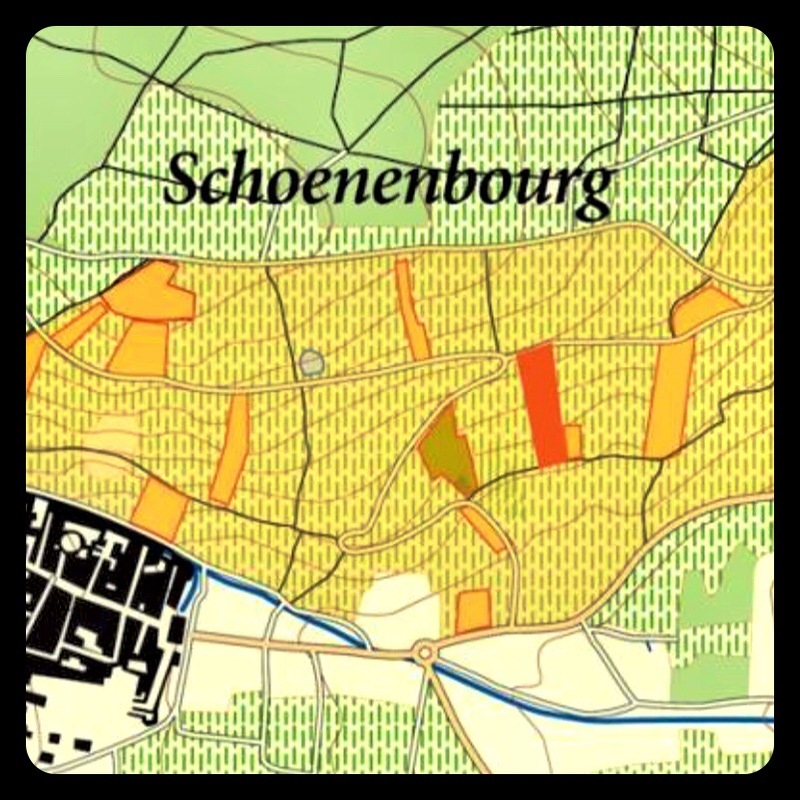 But the Schoelhammer plot, from the Schoenenbourg Grand Cru, which overlooks Riquewihr, has always been one of Hugel’s favourite single vineyard sites and as such, was often vinified separately to the other Riesling parcels. In 2008, climatic conditions were a carbon-copy of the excellent 2007 vintage. Budburst at the end of April was quite late, but May was warm and sunny so flowering began on 15th June and took more than a fortnight to complete. July and August were particularly cool with hardly any rise in temperature, but in mid-September the Indian Summer arrived. As a result, the grapes ripened slowly but fully, perfectly healthy and with excellent acidity. 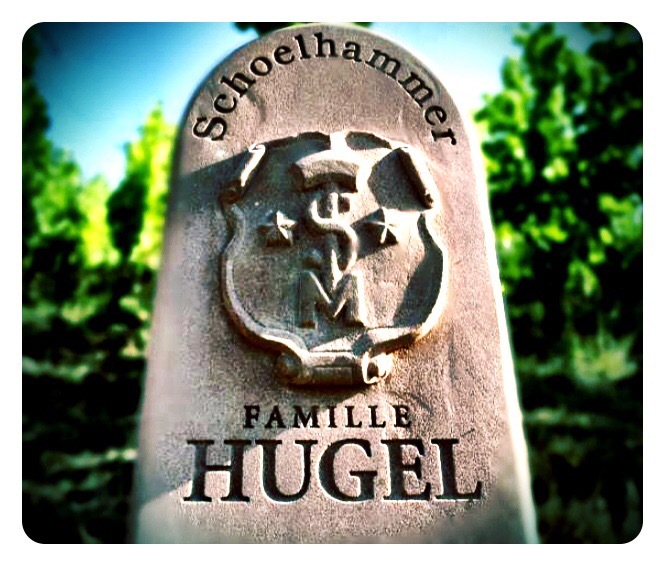 Schoelhammer covers a mere 6 300 square metres (67 800 square feet), 30 rows of vines dedicated to Riesling and organically farmed. Its triassic clay-marl terroir is farmed organically so as to best reveal the complexity of its rich sub-soil. Only 2534 bottles 750ml were produced with a 12.35 Abv., a 7,85 g/l TA, from vines with an average age of 23 years old, yielding 31 Hl/Ha. 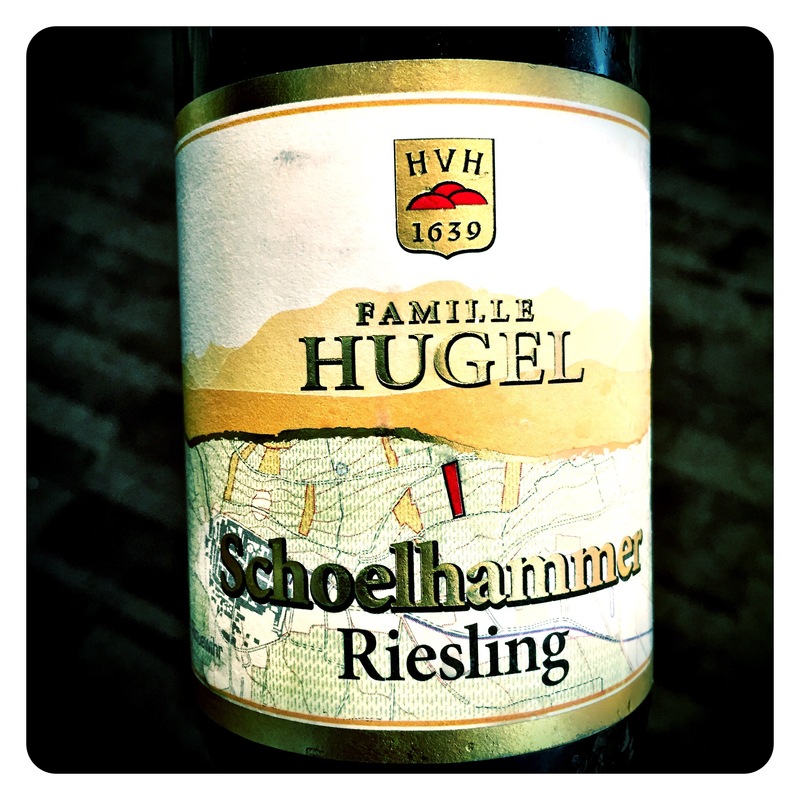 Tasting Note: Famille Hugel Schoelhammer Riesling 2008 – This wine has a very pale, youthful colour despite being almost 10 years old. The nose is liquid minerality personified. Limestone, wet pebbles, and crushed grey slate marry with intense notes of dry lemon citrus, lemon grass, white pepper, spring flowers, and yellow grapefruit. There is such amazing intensity of lemon / lime cordial and green apple pastille fruits. What a profound wine with such power, intensity, breadth and length. Wow. This wine’s finesse and sophistication really leaves you breathless.